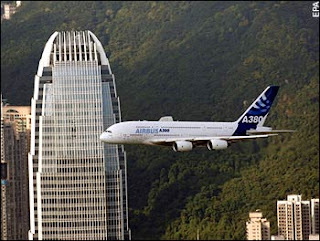 The first two tickets for the maiden flight of the Airbus A380 super jumbo (which flew over Hong Kong harbour yesterday) have sold for $100,380 on Ebay! Singapore Airlines are responsible for the first A380 commercial flight, from Singapore to Sydney on Oct 25. 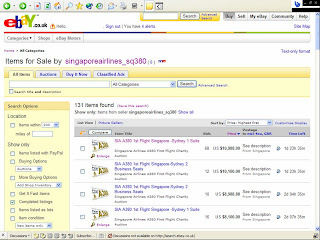 They are selling the majority of seats through their Ebay account and continue to do so at http://myworld.ebay.co.uk/singaporeairlines_sq380/ - Ebay username singaporeairlines_sq380. Using Ebay to sell the first tickets is very original and giving all the proceeds to charity is a nice touch. This has raised the profile of the maiden flight and is a clever way of drumming up publicity!